Bio-Gro's potato fertility system is unique, effective, and proven to increase yield. 20 years of early applications have proven that pre-planning is the most important window for Bio-Gro products. Get the most out of your starter and bio-fertilizer package -- put it where the plant really needs it for early root growth and development. In-furrow applications deliver the full concentration of active ingredients when and where it is most effective, aiding growth equal to broadcast applications at much higher rates. Spray in-furrow directly on seed pieces. 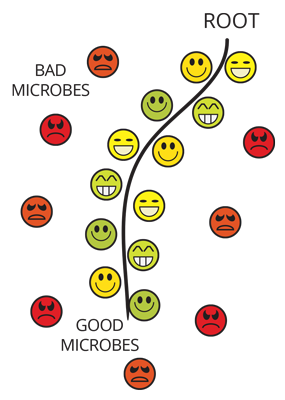 Good microbes encounter growing roots first, crowding out the bad microbes and preventing them from colonizing later. You can rarely increase P levels in the plant. The level you start at is the level you get all year, which is why it is so important to start right. Bio-Gro's Potato Fertility System has the building blocks for vigorous potato plants to produce powerful roots that maximize soil contact. Bio-Gro programs strive to make immobile phosphate more available to the plant with direct application into the seed furrow. Our goal is to maximize root to soil surface area and maximize early phosphorus uptake by promoting root health. Potato plants develop most canopy dry matter from 6" rosette to full row closure, taking up 60-80% of their nutrients. For a 30 ton/acre yield, plants may require up to 20 unties of K per day, far more than even some of the most fertile soils can provide. Applying Bio-Gro's premium humic acid during this rapid growth cycle provides colloids that increase nutrient uptake, especially potassium. 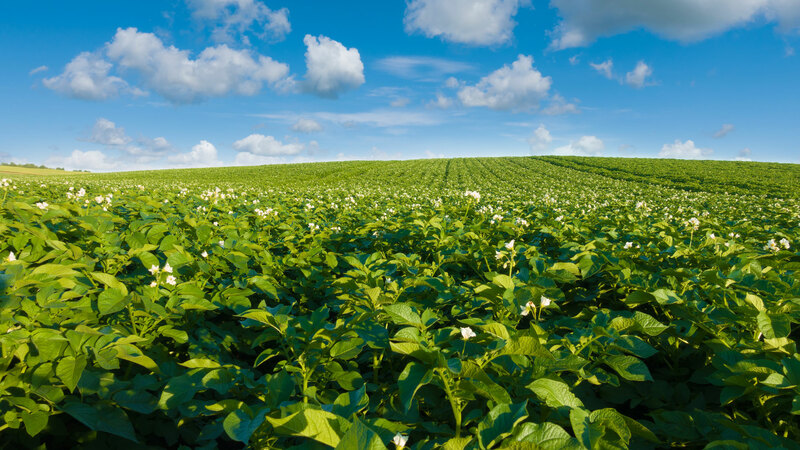 Yield potential is not only limited by the amount of K present, but the ability to take up a volume of K. Bio-Gro's Potato Fertility System addresses both of these issues! An optimum nutrient uptake system. Robust roots and maximized root-to-soil interface. Roots spreading from row to row. ideal for broadcast or irrigation fertilization. Desirable microbes living on the roots inhibit disease. Healthy roots vigorously growing from germination through the bulking stage. Only 2% of identified fungi are parasitic to plants, so why do we try to kill everything that is growing on or near the plant roots? Although we don't recommend eliminating fungicides, Bio-Gro's Potato Fertility Program can sustain a community of beneficial root microbes (including PGPR and VAM) early in the growth cycle, when the plant's root system is small enough to manage completely. Early applications of Bio-Gro products combined with a focused fertility program is the key to success. Bio-Gro's system is made to keep the leaves healthy and photosynthesizing longer. All the energy to grow roots, to grow healthy vines, and to maximize the amount of starch (solids) available to the tuber, comes from photosynthesis. More convenient, more accurate, less labor. 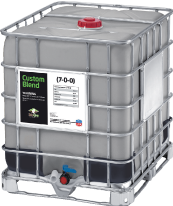 Bio-Gro will deliver the program pre-blended in bulk or a tote for your convenience. No more washing and disposing of jugs.